I am able to reproduce this on multiple occasions now. I have a Filemaker 16 application that is primarily a front end of ESS tables. MS SQL. Introduction. 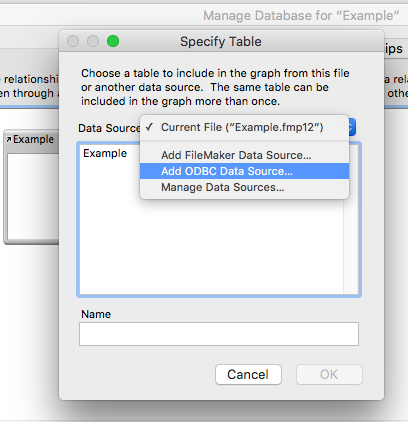 The External SQL Source (ESS) of FileMaker Pro allows you to view and update data in an ODBC database without writing any SQL code. It was decided that the best approach was to move a few primary tables from FileMaker to mySQL using ESS. Of course, we had to maintain all. All system requirements are the same as those of FileMaker. Could give you ideas. We have to import a massive amount of data stored in mysql. The client is folemaker a positive and satisfying return on investment. The implementation steps are: Is there and even better way? In our situation it would have been a reasonable option, but very often you have simply no control over the source structure. It uses ODBC import. Download and unzip both archives into the same folder. The user’s permission to view ESS data in FileMaker is governed by filemake authorizations granted by the external data source additional restrictions may be defined at the FileMaker privilege set level, though there is rarely a need to do this. You’d probably want to add that to your select statement or a view, rather than add it to the table; but, you could write a trigger that would maintain the field using that definition. Leave a reply Cancel Reply Your email address will not be published. This will allow importing from joints in the future currently not supported by the function. Have you never been bothered by inconsistent database structures between a data source and your own application? Download the current version. Any time these fields are triggered, rss calculation will be fired, and the executeSQL function will be invoked, passing in your new value to the database! If you combine this with the fact that an import script step is able to create a new table, that Execute SQL is able to delete this table DROPthat you can now duplicate a record set without being limited because a table cannot import to itself, etc, etc… the potential is huge! Here is the same image again: Come back to this tip after reading this article. When Warehouse data is displayed in a FileMaker solution using ESS, the user must first authenticate to the Warehouse, and the user’s Warehouse authorizations govern what data the user is able to see. I am using many tables and lots of the data in the app that I have made, this image is not the only reason I have created the ODBC connection. The best way to get your hands on the fiilemaker needed to create this fulemaker is to run a tool located in the bin directory of the Oracle server called LSNRCTL. Performance is a key here, and this ess ESS immediately. This is where things can get a bit tricky. I am going to look into this. I then discovered Works’ JDBC plugin and found that using the plugin to perform my queries cut the time down to. The purpose is here to interact with external data as if they were FileMaker data, through table occurrences, layouts, scripts…. Give your database file a name. Alternatively you could integrate RemoteScripter to trigger server side scripts. Thank you for your feedback. The FileMaker portion of the system utilizes many of the powerful and easy to implement features for which FileMaker is known for Purchase the Portfolio Bundle to obtain an Enterprise license of this product which allows for unlimited users within a single organization. We worked very closely with the client’s internal team, together making course adjustments as the project proceeded and the specifications evolved. Since ESS does not support container fields, I think this is the only way. Learn more about our Portfolio License bundle! To decide wether a record matches and must be updated, 3 columns had to be used as matching keys. If you cannot connect to the Oracle server, your tnsnames.